MFA AC+D Alumni reflect on their path and practice before-during-after+advice on the MFA AC+D experience. Before ACD I was working 6 days a week at a great Art Studio in Grass Valley CA, called The Artist Studios in the Foothills (ASIF). I was living the life that I had always dreamed of, doing what I always wanted to do. I was a ceramics instructor and living out in the country. I thought that I had finally ‘made it’, but I was not as happy as I could be. Going to grad school and giving myself a more focus, and exposure to different things, is was what I needed ... a change! The AC+D program was attractive in many ways. The studios, shared spaces, the facilities, and all the resources of two great schools- it was the right choice. Working with and along side of so many different people /classmates, the Bison Building was a melting pot of ideas, artists, makers and creators, all under one roof. The mentor aspect of the program was a great benefit and balance to the studio practice and class component. The visiting artist lectures were eye opening, and a great opportunity to meet people and see what they love to do. Pearl Fryer, Amos Kennedy, Natalie Chanin were memorable. Having conversations about interesting things, with mentors, visiting artists and anyone who was willing to talk. In my current job there is lots of “just get it done” talking and not much philosophy. I miss the Bison Building, being in class and conversing with all my classmates was a lot of fun. We could have very heated and tense moments, along with really fun and memorable times. The practicum project spearheaded my career into Orthotics and Prosthetics. I remember thinking “I need a design team to work for me. 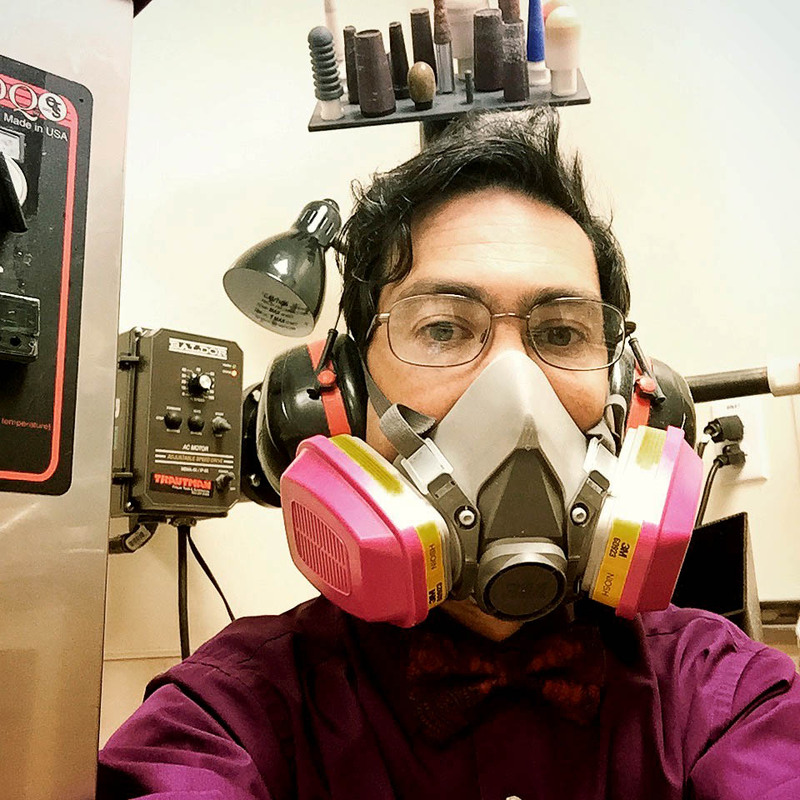 If only I could get an orthotics guy, a shoe guy, and a crafty guy to work together under one roof to make what I need, my problem would be solved.” It turned out that I was all of those guys and the Bison Building was my studio. I could not make the different offices have a conversation about craft, so I brought the conversation and resources and my own studio (in the Bison Building) and started to work. After all pieces, materials and tools were in the same place, the total project only took 8 hours of ‘work’. As I finished my practicum project and paper, “Cobbled: Just Like You”, I felt a great sigh of relief. Yes, the final project was over and also better yet, I could walk and my feet did not hurt at the end of the day! I had accomplished what no custom shoe manufacturer or Orthotics office was able to do, I had met my own need. The physical project was only intended to last 1 year. It has lasted 4.5 years and I have not found anything better, nor anyone office that can make a new and improved one, so I keep wearing it, all day everyday. Scheduled innovation, or does it just happen? Making an object for daily use, to be an intimate part of someone’s life can be coffee cup or and prosthetic leg.